Appearance – Budweiser pale-yellow with bubbles coursing through it. Nice thick white head with audible crackling from the bubbles bursting. Smell – Aroma has a strong wheat note and some sour/funk in the nose. Taste – Plenty of smooth lactic acid. There is a remnant of the Pils malt (or possibly DMS) in the after taste, this fades after the first half of my sample. Not a particularly complex flavor, sort of like a sour hard apple cider. Mouthfeel – Thin with prickly carbonation. Very quenching on a hot summer afternoon. Drinkability & Notes – Very easy to drink, but that aftertaste takes away from it a bit. If I had it to do over I would probably give the beer a short boil to drive off some of the DMS/Pils flavor (or use a higher ratio of wheat to Pils malt). Appearance– Deep purple/red with a pretty pink head. Head retention is not as good as the plain sample, but it still stays around for a bit. A few blueberry seeds are visible at the bottom of the glass. Smell – Light blueberry pie, with just a hint of that wheat aroma coming through. Taste – Much smoother flavor, almost none of the Pils malt character from the plain version. The blueberry is there, but it is not as strong as I expected. The sweetness really changes the perception of the beer. Mouthfeel – Adding the syrup knocked out some of the carbonation and boosted the sweetness, particularly linger in the aftertaste. I liked the snappier, crisper finish on the plain one, but this one certainly has the edge in complexity. Drinkability & Notes – Tasty and again very refreshing, but I would have liked more blueberry flavor and less sweetness. I think the fermentation of the raw blueberries that I'll be adding to my lambic will result in a more pleasing beer (but probably not as refreshing). I bet this would be a terrific gateway beer to give to people at a summer BBQ. Appearance – Looks like ruby red grapefruit juice, with a thin white head. 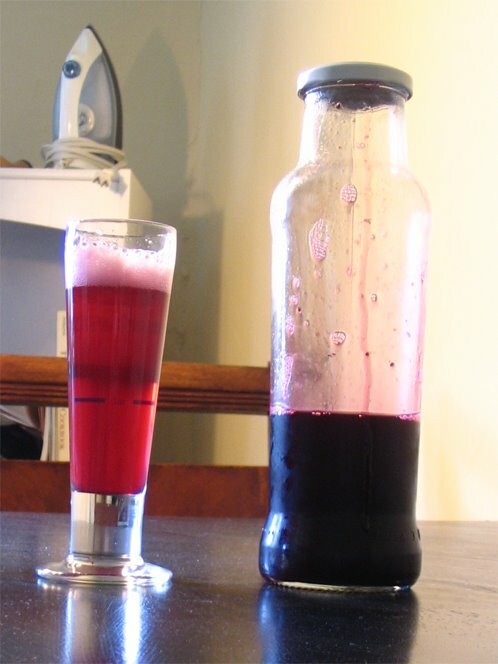 Smell – Light raspberries with some of the lactic sourness poking through. Taste – Sweeter than the blueberry version, even with less syrup. Tastes rather flat/dull, there is some raspberry, but the sweetness deadens the rest of the flavors. The sweetness lingers leaving the tongue with a slightly unpleasant coated feeling. Mouthfeel – Carbonation seems sharper than in the blueberry version, but the body seems a bit thinner. Drinkability & Notes – Solid, but the not terrific. My Berliner Weisse with the raspberry syrup went over very well with people at a party a few weeks back, definitely a good option if you are looking to make something along the lines of Lindemans Framboise (sweet/sour, and fruity). Appearance – St. Patrick's Day green body with a touch of green in the head. Head retention is sub par. Smell – It smells like childhood, some weird combination of Lucky Charms and Play-doh. Basically no evidence of the wheat or acid of the base beer. Taste – Sweet Luck Charms marshmallows with some wheat and sourness. The sweetness seems less intense than the raspberry, but it still lingers unpleasantly. Mouthfeel – Moderate carbonation, slightly sticky body, but it finishes rather clean. Drinkability & Notes – It is a interesting flavor to be sure, but I'd be hard pressed to finish off a pint of this. 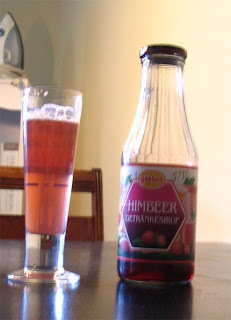 The commercial syrups are worth a try if you have never had them before, but neither of the ones I found at a local German Cafe really give you a great flavor and they will both add too much sweetness to preserve the quenching acidity. There are a world of other homemade syrups that might be good in this beer. Sure its a tasty/refreshing style on its own, but it is also a beautiful clean canvass for other homemade syrup options. Are you mixing these by the pint? Why not try half a tablespoon of woodruff? The amounts were for the 4 oz sample glass shown, so 1 tbls (.5 oz) with about 3 oz of beer (6:1). The recommendation on the bottle was for slightly more syrup than this. Blending is very much a personal taste activity, I wanted to review these with a standard dose of syrup as opposed to adjusting it to my taste preference, which would have been less syrup. 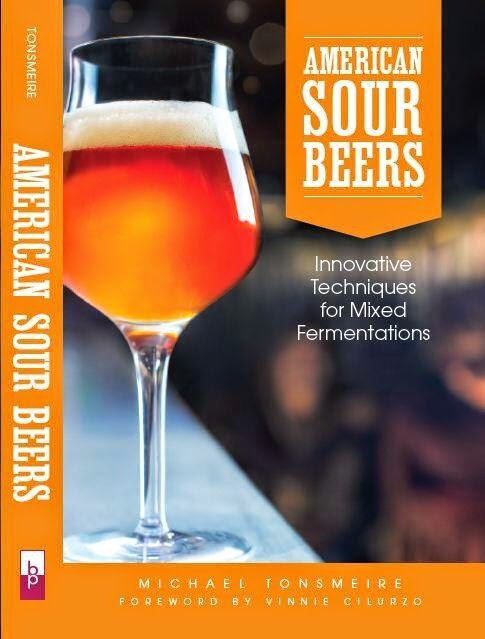 I tend to just drink the beer straight or with the blueberry syrup, it just seems like a waste to spend all that time/effort brewing and aging a beer only to dump in cheap commercial syrup. I think the biggest advantage of making your own syrup is that you can adjust the flavor and sweetness components separately. I would definitely cut back on the sugar in the blueberry syrup, although that might lower the stoarge stability of the syrup. 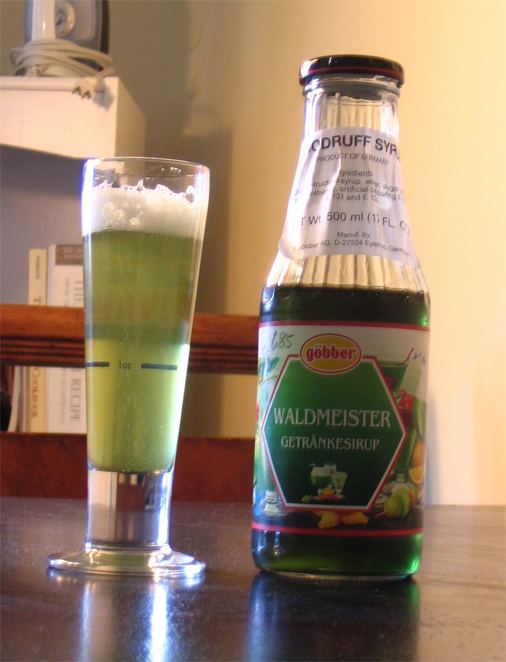 For anyone too lazy to make a Berliner Weisse that still wants to try some syrups you could make a very dry wheat beer or just use carbonated water.